v2.1 released with the fix – most grateful! Also, thanks for the pointer to Yad – looks vastly more useful and superior than zenity. As for PolicyKit – yeah, parsing XML… fun ;) Although I'm definitley thinking Python for this (makes it easy to do a nice GUI front end with text fallback if required). Kevin, first off, thanks for all the hard work. I ran v2.1 which seems to compile and install alright. I then configured RDP to use Unity-2D. When I connect with Remote Desktop from Windows I get the logon screen, where I select sesman-X11rdp. Tim, hi, hmm lemme test this again… pretty sure it's been working fine for me – This is on a Desktop or Server edition of Ubuntu? Thanks, Kevin. It's 12.04 x64 Desktop version. Tim, in the meantime, can you look at the file ~/.xsession-errors ? That might give you an indication as to why your unity-2d session isn't starting. After several more (re)installations of Ubuntu and XoM I can now connect but no session manager is loaded. I ran RDPsesconfig –zenityfrontend which allowed me to see error messages in the console. Why is the utility trying to access "/proc…." !?!?!? dialogtext="You selected $usercount user(s). Do you wish to proceed?" echo "Creating .xsession file for $username in $homedir with entry \"$session\".."
This gets the home directory of the user name from the /etc/passwd file by extracting the 6th field from that entry in /etc/passwd. actually create the .xsession, tell you what it's doing, then change the ownership of the .xsession file to be the user in question, then changes that to be an executable file. The only way that the variable "$homedir" could equal "/proc\n/home/tim/" , is if you somehow have "/proc\n/home/tim/" as being the home directory entry in the /etc/passwd file on your system! And see what the result is? If it's anything other than "/home/tim" then something's very wrong somewhere. No idea why /proc is in there. This is a vanilla install of 12.04. Unless unetbootin did something it shouldn't have? Yeah /proc should NOT be there! I can't see how that could possibly be there using that command! I can only think that your passwd file is somehow corrupted? Have a look at your /etc/passwd file – any possibility of using pastebin.com to paste it there? Is there any way you can install Ubuntu using a burned CD instead of Unetbootin? Which has 'tim' embedded in it : so the grep picks up the line, and you extract /proc from it. grep does not verify that tim appears in field 1. You want to grep on something like "^$username:" to exclude false positives. Oh my! Yes how can I be so stupid as to overlook that! First of all my apologies – it was the fault of the utility for confusing your username (tim) with another entry in /etc/passwd . I have corrected this in v2.2 – just download this and run the RDPsesconfig utility – you don't need to run the xrdp installer again if that bit is working. Tim, okay so I installed a fresh copy of Ubuntu 12.04 Desktop 64-bit into a vm, and ran x11rdp-o-matic (really must think of a better name ;) ) updated to the latest Ubuntu package versions, then ran RDPsesconfig to configure my one user "kcave" for unity-2d. Result was I could log in with no problem – I cannot duplicate your error condition. So I tried again by creating an additional non-administrator user, "John Doe". So yeah… hmm… again, I suggest you have a look at the ~/.xsession-errors file and see if there's anything in there which might suggest what's going on – perhaps you could copy that and paste the contents into pastebin.com so I could have a look as well? Hmm y'know I'm increasingly seeing mention of this Flattr thingy. I just looked at how it works – I might try adding it and see what happens, if anything. Today I tried your new script and after installing necessary packages, it finally works. Perhaps Tim is missing a few packages, too? I installed all the things, you mentioned in the v1, which are: git, subversion, libssl-dev, libpam0g-dev, automake1.7 and 1.9, build-dep xserver-xorg-core and of course the preferred GUI (LXDE for now). It worked as long, as I don't reboot the server. When I do, it seems, I have to login at least once local on the server (either direct or via putty), to get a working rdp-connection. When I try a connection directly after a fresh reboot/start, I get a crippled LXDE desktop. By crippled, I mean: No applications, no background image, etc. I didn't know, if it was LXDEs fault, so I uninstalled it (purge, and "apt-get autoremove" to get rid of unused packages), then installed XFCE. So, when I start the server, it stops at a console tty1 login, which is OK for the server, but if I try a rdp-connection, I see again the crippled LXDE desktop, despite being uninstalled (how can that even be with the files been deleted? o.O ). When I do a local login or with putty to console first, no x-server, then I get a rdp-connection to a working XFCE4 desktop. I've yet to see that behaviour on ANY of those tests! Without having a poke around your installation, it's extremely difficult to debug what the heck is going on with your system, so frankly I'm at a loss to even guess why that's happening. I also don't know, what I could've done wrong, there is not much to do while the setup runs. You know how it works: Partitioning, formatting, encryption or not, choosing which daemons should be installed (SSH, VM, Web-Server, etc) and that's pretty much it. It's a fresh install, with Samba, SSH-Server and Virtual Machine Host. After setup was complete, I installed LXDE and waited for your Script v2. Could the encryption of the whole system cause a problem like that? But decryption is already done at boot. Well it's no huge problem, since I have to be present to type in the decryption password anyways, after that I can log in, log out and everything works as it should (but another problem exists, but that has nothing to do with your script or RDP …or perhaps it's the same cause? I found a script for using in init.d to make qbit***rent-nox run as a daemon, I have to start it manually after logging in, despite it should automatically start at boot). Y'know, after re-reading your post earlier, it almost looks as if the init process (which starts the services on boot) hasn't completed for some reason – and in that case, services haven't started up yet (like d-bus for example, which is used by various desktop environments) – this might be what's happening? As for your added init.d script, after you install the script into /etc/init.d , you also need to let your system know WHEN to start and stop that service. That's done by using the update-rc.d command. Read the man page on that – it's quite nifty. By the way – thanks for the donation! Nvm Kevin i figured it out. Glad that's working for you – what was the problem/how did you sort it out? And even then, whatever it's set to in /etc/passwd is by default the "correct place", because when you log in, your system gets the login's home directory from /etc/passwd. Kenny, this problem may have been related to the way user's home directories were obtained – v2.2 corrects this bug. The Paypal page comes up in Japanese? Whoops! Yeah I currently live in Japan and have no choice but to use PayPal Japan – I'll see if I can do something to configure it to English… thanks for that heads-up – it's great to get this kind of feedback from people! 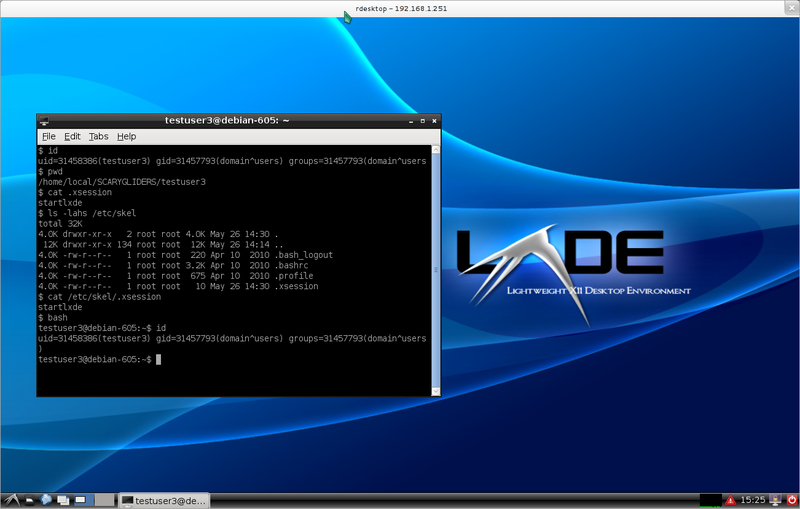 Thanx a billion for V 2.2. working on Ubuntu 11.04 64-BIT VPS with lxde beautifully. There is a small error related to starting installation but simply retrying the installation proceeds flawlessly. That's something OS-related. Otherwise everything is as explained and plug and play. I think x11rdp is not being compiled correctly on my machine. All I see in the /opt/X11rdp/bin is "cxpm freetype-config makestrs sxpm". Does this look right? How do I find the problem? Thanks! Appears to be related to the following? At a rough guess I'd say your system could not download the packages necessary for the utility to compile the source code? The onlyother possibility I can see right now is the x11rdp source code has been changed – but I doubt it. Please check your system's package availability and ability for apt to download packages from the internet. I can now connect but I only get the grey X window without a desktop session. I noticed that I do not have the /etc/X11/Xsession to which the startwm.sh is linked. Any idea why I do not have Xsession and how to fix this? Yes I've also encountered the odd disappearance of that file once – never did find out why. If re-installing x11-common doesn't reinstate that file, try forcing a purge of x11-common and then reinstalling it. That means issuing "sudo dpkg -P –force-all x11-common" . Your system will whine that other packages depend on this, but you're going to be issuing an apt-get install x11-common straight after that, so it'll be fine – I've done that before. I remembered that I had /etc under etckeeper (git versioning for /etc) so I went back and looked at the log. The Xsession file was deleted during one of the delete or purge package changes for xrdp. However, there were also changes for removing the nx user, group, etc. from a previously purged nx-server installation from few days earlier. I am not sure why the purge of xrdp had any relationship with the previously purged nx-server installation and why the Xsession was deleted with the xrdp package changes. I didn't examine the situation in detail but I have the Git log of changes of /etc, and the dpkg log for the same duration saved and I will look again when I have some time. I restored the last version of Xsession from the Git repo and everything is working now. Thank you for your help with this issue and for putting this script together. Do you have plans to do a version of this for RHEL such as Centos 6? So I've installed Centos 6 into a VM to get to know it… it seems a wee bit out of date – also, there's no xrdp package for it? I did find a package repository that seems to package xrdp though. I'll have to modularize the utilities so they use Apt for debian-derived distors, and yum/rp, for the red hat-derived distros. Looks like a bit of work. At first it might only support Fedora (which I've also just installed in another VM). Odd, the RDPsesconfig utility should have configured that all for you on Ubuntu Server 12.04 – I've tested it extensively on that. Kevin like to first thank you for building this script out! My one question would be any reason as to why you didnt utilize X11rdp 7.6 instead of 7.1? The github has the newer Xorg stuff already packaged in. I am however keeping a close watch on the progress of the bleeding-edge version. Yes I have been having issues compiling Xorg 7.6 throughout all the distro's, the newer ./buildx.sh script is pretty cool in that it downloads many of the modules needed, but some thing's are still not functioning at times from distro to distro. Using v2.3 on ubuntu 12.04, although the tool says all was installed fine, it really wasn't — xrdp was nowhere to be found. \nCongratulations!\n\nX11rdp and xrdp should now be fully installed, configured, and running on this system.\n\nOne last thing to do now is to configure which desktop will be presented to the user after they log in via RDP. \n\nUse the RDPsesconfig utility to do this. which brought in "automake libpam0g-dev". Getting past that, xrdp/X11rdp built and installed successfully. CLI environment translated to my language (pt_pt), and the script isn't coping with that. + DpkgStatus='O pacote `libtool'\'' não está instalado e não está disponível informação. Thank you for this! Yeah as you can imagine, as an English-only speaker (well… a little bit of Japanese but not much that it counts)… I wrote the utilities in a purely English locale – it didn't occur to me that the output from dpkg etc. would be translated according to different locales set by the user! thank you for your hard and continuous work. I tried your script on Debian 6.0.5 (just distupgraded from lenny). Had to install a few packages manually like Pedro Alves but now it finishes with no errors. When i try to connect from a Windows machine i just get a black screen. My knowledge on x in genereal is rather limited so i was happy to find your script but this leaves me also with no clue where to look for problems. Presumably you ran the RDPsesconfig utility as well? "Okay from another computer try running your RDP client and see if you can connect and log in to an RDP session…"
Any news on the CentOS 6 X11RDP-o-matic? Wo0t that would rock! I haven't spent much time on this to be honest – I have taken a look at CentOS 6 though. It doesn't have an xrdp package available in its repositories, but I was thinking this morning that shouldn't be too much of an issue. I'll try to have a look at this today. Hi, i can't get SVN working. Is this the rigth server? or execute a command svn on a computer with open svn port and copy folder x11rdp_xorg71 to your home directory as a normal user (not root). by this time the /opt/X11rdp must already exist with root rights. Check /opt/X11rdp/bin/X11rdp (4.0M) and /usr/bin/X11rdp (correct link). good luck. Thanks, Andy. You got me going in the right direction. For my server, the firewall is a little overzealous, blocking 'svn://&#039; addresses and 'docs.google.com'. Jus letting you know there is a problem running xrdpomatic on amazon EC2 instance. the login is fine and once it says connected, the screen disappears completely with no error or anything–tested from two different versions of windows. I can provide access to the cloud instance if you need to debugg. oops I should also mention that the instance is running as Ubuntu LTS 12.04, which worked flawlessly on other setups. I've not used Amazon's cloud service (or any other cloud service for that matter). I'd have assumed that if a "supported" linux distro runs in such an instance then it should behave in the same manner as running it in a VM or on real hardware. Something weird has happened for me. Ubuntu pushed out some Xorg updates and at approximately the same time, xrdp somehow stopped running at start up. Actually, it appeared to be uninstalled. Anyway, forget I said that. I re-ran the xrdp11-o-matic and RDPsesconfig scripts and functionality seems restored EXCEPT .xsession is not automatically executing when I connect to the machine. Despite my having run RDPsesconfig, my desktop appears like your screenshot above that's labeled "We haven't ran RDPsesconfig yet!" I can then run ". .xsession" and it brings up the desktop, but I'd really rather not have to do that. My question for you, or anyone else, would be is there any quick tip for getting .xsession to execute automatically if RDPsesconfig isn't setting it for me? Does the file /etc/xrdp/startwm.sh exist, and if so, is it a symbolic link to /etc/X11/Xsession? Does the file /etc/X11/Xsession exist? If all of the above is true, try making the .xsession file executable; chmod .xsession in your user&s home directory. The file /etc/X11/Xsession doesn't exist. The file /etc/xrdp/startwm.sh is still linked to it despite it's failing to be. So bizarre. Here's what I see. Okay so for whatever reason, /etc/X11/Xsession has been disappeared. I've seen this before, and it's a mystery I've yet to solve. You should find that /etc/X11/Xsession is now back. Just make sure that the /etc/xrdp/startwm.sh symbolic link is OK.
OK, so you were right. X11-common was still installed according to synaptic. Doing as you described, I tore x11-common out and reinstalling it. And that restored Xsession. I checked the symbolic link (it was fine), and I checked the .xsession file (which appeared correct). But it didn't change anything. So I ran RDPsesconfig.sh again. And now it works. Does that make sense? As for the move, well I think we'll be out of this house near the end of September – not long to go now. Me and mine may stay at my wife's parent's place for a day or two, then we'll fly over to Scotland. We'll stay at my folk's place for a bit, and I'll have a busy time getting stuff sorted out from there, which includes looking for a new home, etc etc etc. It's going to be a tough few months ahead. First, I just want to say that this is a very impressive effort. I have used it with great success on Ubunto 11.11. After doing that, rdp appears to work fine. My quesiton is, with Ubuntu 12.04, are there any advantages to running X11rdp-o-matic rather than using apt to install xrdp? When you install xrdp from the Ubuntu repositories, you don't get the X11rdp server back-end. Instead, you get the VNC server back-end. This works, obviously, and you get access to a remote desktop. However, at the end of the day, you're getting a VNC back-end via the RDP protocol. By using my utility (or doing it via the manual method) you're getting the RDP server back-end, so it's RDP all the way through, and in my opinion you'll get a more efficient (faster) performance on your remote sessions than you would with the VNC back-end. Unity 2D, the light-weight counterpart to Ubuntu’s Unity interface, has been retired from Ubuntu 12.10. So are will xrdp and x11rdp support Unity after this occurs? I am of the opinion, however, that having spaces in the names of directories is a huge no-no – especially if it's a user's home directory, or even if it's to place the Scarymatic tools within a user's directory. I tried it on a fresh Debian Squeeze installation. Login to xrdp works but thereafter the connection is closed. i have the same problem here, any ideas? It is a fresh ubuntu 12.04 LTS Server installation. If you connect and get desktop with no panel or icons the following statements might fix your issue, it did for me. One thing I would like to ask about it though, is there anyway to install Cinnamon instead of MATE, in the file you provide? Or if not, what are the commands to run to get cinnamon back? So basically there's a file which appears in 2 packages at the same location, dpkg sees that, and aborts trying to install the package. It's an error I've seen many times before – 2 packages conflict because they both contain the same file. In this case, I'd probably try to remove the mdm package. By the way, it looks like MDM is the Mate Display Manager. GDM is the Gnome Display Manager, so I suspect you're going to have to use one or the other, as they probably will conflict. Thank you for the response. I was thinking along the same lines, however I thought I had to use gnome. 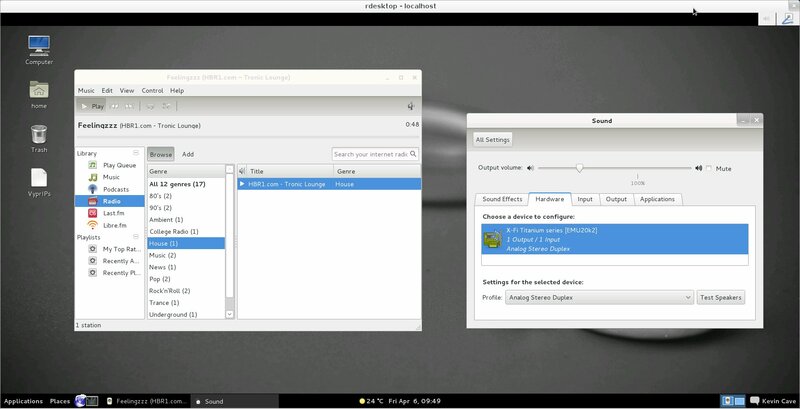 I removed gdm and set RDPseconfig.sh to MATE since I am using Linux Mint. One issue I am having is that it will prompt me to log in with sesman-X11RDP and it says connected but then immediately drops me out. Thanks for your great work, Kevin. I've been using your guides and tools over the last few days, but I just can't get a sesman-X11rdp session running. sesman-Xvnc runs fine, but my objective is to get the speediest remote desktop I can. My system is a VM — Ubuntu 12.04.1 LTS (I'm trying to run unity-2d). I had an issue where svn:// was blocked, so I manually downloaded x11rdp_xorg71, and placed it in the ScaryMatic folder. I used the –reuse flag to make sure it compiled my from downloaded copy. I also use AD, and I'm passing authentication (thanks to one of your other posts). The login prompt when using Microsoft's RDP client or rdesktop just closes down after 'connecting….. connected ok' when logging in with sesman-X11rdp. After trying to connect with X11rdp, I can see the xrdp process running — and another one spins up on every failed attempt. I have to kill them after a while because I run out of displays. One other note, I am able to get X11rdp running manually — it spits errors about fonts, but it doesn't crash. Any help anyone can give would be much appreciated. Well, I finally got this working. Turned out the tarball hosted at xrdp.org was a bit out of date. I had to make my own tarball on a machine that wan't blocking svn then send it to the machine I was installing on, where I put it in the ScaryMatic directory and ran with –reuse flag. Understanding all the dangers blahblahblah of making RDP available without SSH tunneling (though as I understand it, these RDP sessions do have some encryption to them), I'd like to know if there's a way to enable RDP from external. It seems to be blocked from external access when I rdr port 3389 to my ubuntu server (running xfce session) at the office. Running tcpdump on the server, I can see the SYN packets making it there, but not much else. It's also not clear to me where I could change this behavior. Can you provide some tips? How about to use checkinstall instead make install? Did you include –enable-freerdp option to configure? I'd like to thank you for the continuing effort you have put into different versions this set of scripts. Do not see this as a complaint or anything. I ran you script on 2 machines here where I would like to use the RDP to replace the VNC I use for now. I should mention I've been trying to get rdp to work properly on both machines, but I found a lot of little things that are not right, (cut-paste issues, incorrect keyboard settings, unable to properly logoff, unable to select and existing session or connect to the console session, etc ), for which I can't find a solution. This is the reason I tried your script assuming my ignorance while installing and configuring X, vnc and rdp may have caused the issues I see. I have not tried to understand what your script all does and everything. For both machines it recognized the distribution (ubuntu 12.10 and mint 13) and said it was known to work. Both machines indicate all went fine, and I ran the RDPsesconfig.sh as well to indicate the users that can connect via RDP. The result is that both machines when I try to connect using RDP, it says "it could not connect, machine or rdp not running, etc"
A friend suggest I reinstall xrpd since this would recreate the config files that may preventing it from working. Need to get 267 kB of archives. After this operation, 1.561 kB of additional disk space will be used. Then rdp was working again but basically with the same issues I described above. So no problems for me. All is working again but merely as it was before. This output suggest your script removed xrdp. I will dig into the script a bit to see if I can see what happended. If I have have anything solid I'll let you know. You don't use xrdp. So my post already has proved stupid. I will probably run our scrip again as I will start to understand it and try to capture the output so I can see why there was no RDP tcp port listening available after the script finished. Exciting that you made it RDP all the way rather then VNC over RDP. Thanks for the script. I used it with 12.04 x64 on my laptop and it seems to work fine when I tried to connect from Win xp and win 7. But I have noticed something. The remote sessions I login into are independent of the actual session that run on the server. In case I am not clear what I mean is, I have lets say 'user1' with which I have logged in on my laptop. Then I locked the screen and remotely connected to my laptop from a win 7 pc and logged in using the same user id and pwd. I have noticed that the two sessions are not the same. I tried remote logging in from a different computer which is running windows xp and I got the session which I have opened from win7 pc. All remote sessions are one and they are not the same as the session running on the actual server. Before I used your script, all the sessions were different, now all the remote sessions are same but they not the same as the session on the server. I want to remote login into the same session which I have opened on the server. Any ideas what I did wrong ? It fails to find my distrabution it simply detectes it as "." I know the ScaryMatic doesn't yet support Ubuntu 12.10, however I wanted to mention the only problem I've run into using it in 12.10. My environment of choice is Ubuntu 2D. However, after running RDPsesconfig, when I attempt to connect to the machine I am stopped by a dialog that reads "Failed to load session 'ubuntu-2d'." It offers only a button to log off. Seems like I could do something at this point to get the 2D desktop to load. The other choices for desktop environments seem to work fine, by the way, so that's a fine workaround (if any workaround is ever fine). Ah, so Unity 2D probably isn't working because it appears 2D support has been dropped from Ubuntu 12.10 (and 13.04). I'm facing an issue when starting connection "sesman-X11rdp". As you can see, connection "sesman-Xvnc" is working. Can you please assist identifying the root cause for this issue? I fixed the issue with failing connection by re-installing the software packages. Which modification must be applied in order to start the remote desktop in my native language DE? Is it possible to get working for LinuxMint 14 (Nadia) on cinnamon? it only shows the MATE option. it would be great.. thanks!!! Hello. Thank you so much for the automatic script! I think it could work great! I however have a glitch I am hoping someone can help me with. 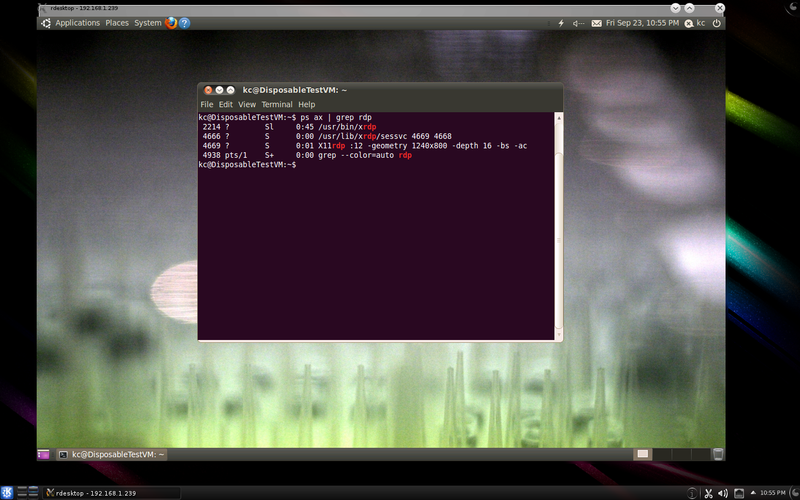 I am running Ubuntu 12.04 LTS Server Edition and I have ran the installer. Seems to have installed fine. However when I try to RDP in from a Windows PC using X11RDP, it says onnected – OK" but then the screen freezes for about a second and then the whole RDP x-screen dissappears bringing me back to the RDP Connection Wizard. No matter how many times I have tried this, same thing happens. The only part of the installation process that went sideways was the RDPsesconfig.sh script. It would not run. I tried via terminal and then GUI. Terminal could not find it and got no response when running it from the desktop. Obviously I am assuming that this is what is causing me grief, but I just dont know where I am going wron. Any help would be greatly appreciated! Firstly, great job on this! It's much appreciated by me and it seems, everyone! After I installed x11RDP I ran the RDPsesconfig and it worked fine. I then installed xfce so I could use it as an interface as unity-3d does not work and unity-2d has been removed in 12.10. After I installed xfce I found that there was only the xfce option in the RDPsesconfig script. Where have the others gone and is it a bug or something on my side? I sure do appreciate that you put this tool together … but I have hit a brick wall with it, and can get no further. sending login to session manager, please wait. I know nothing about sesman, RDP or X11 so I have no idea where to begin to look for further details. Google searches on "xrdp_mm_process_login_response: login failed" turn up very few results, and those don't seem to apply to my case. Can anyone suggest what I might have done wrong or some sort of boundaries on the problem so I can begin tracking down the cause? I have zero experience with RDP, X11, sesman or any of the other tools, so I am stabbing the dark trying to find a root cause. I'd be very glad of any hints as to how to narrow my search for a solution here. I am no closer to solving this. Due to lack of response here, I also asked this question in the [Xrdp-devel] list. If using xrdp 0.7.0, you need to make a change to the X11rdp source code prior to compiling. I would not use the X11RDP-o-Matic from ScaryGliders as it does not make this change. Thanks for your effort in creating this script. Here's some feedback though, as it doesn't work on my system. Can't call method "description" on an undefined value at /usr/share/perl5/Debconf/Question.pm line 93, <GEN0> line 1. Use of uninitialized value $ret in scalar chomp at /usr/share/perl5/Debconf/Client/ConfModule.pm line 132. Use of uninitialized value $ret in split at /usr/share/perl5/Debconf/Client/ConfModule.pm line 133. Use of uninitialized value $ret in string eq at /usr/share/perl5/Debconf/Client/ConfModule.pm line 134. Obviously, continuing to let the script build the sources is futile, so I stopped the script. I'm not sure about the first couple of error messages, but it seems like you are relying on svn and git, which are both not installed on the system. Maybe you should check for their existance and get them using apt-get when needed. I'll try to fix the git and svn issues later when I have some time. Those errors are being caused by Something Wrong On Your Machine – my scripts use dpkg-query to check the status of required packages on the system it's running in – in other words, if dpkg-query is broken on your system, which is what that looks like, then it won't be able to find out if the required packages are installed or not – hence the problems you're having down the line. Try running gpkg-query manually on your system and see if you still get those error messages. You may have some repair work to do – possibly re-install the dpkg package (heh, ironic) might sort that one out, also try reinstalling debconf – there may be some other related package which is broken, but anyway something IS broken on your system relating to package managment. can be run to clean up a system that has it. Have tryed to set my session to gnome-shell in my .xsession file but this was a no go… Have any of you tryed this out? And/Or found a way to do this.. I have installed this on ubuntu 12.04, yet I find somehow slow, really slow, it takes half a minute to get 1 frame, the connection uses around 100KB/s which is neither the limit of the client nor the server…something is not right, is there some kind of tuning options for network? Hi, just to let you know that this works via script-o-matic on Ubuntu 12.10 x86 and Xubuntu 12.10 x86. Both scripts need to be called via bash instead of sh e.g. "bash scriptname.sh" because Ubuntu uses dash instead for sh which can't handle your syntax. I had to install use gnome-session-fallback as Unity goes nuts on Ubuntu still. Can't logout using the applet but I have yet to read your policy information yet. Xbuntu just works being that it’s XFCE4. Works via RDP on Windows 8 Pro x64 @ 32bit colour / 1080p. Both my machines are virtual on Hyper-V 2012. I’m working on a new release which will use the current source from git – probably a few days away so stay tuned. Any updates on this? I’ve been messing around with it for a bit, but always have problems with the PID files and permissions to config files after updating xrdp and X11rdp. Slowly but surely working on it. There’s a beta version but being beta, it’s not absolutely ready for prime time just yet. It’s very difficult to make generic enough to guarantee working on every distro, and testing takes up an inordinate amount of time, because testing involves running it and waiting for compilations to finish. It would be nice to have more people involved in improving it as well – I have one additional collaborator (Gustavo) who’s recently done some good stuff on the beta development. Thanks for the useful tool. It cCompiled, installed, etc. just fine on 12.04 LTS desktop, runs and I can connect from Win 7 client no problem, but how to make RDP grab the session already logged-in at the console? I log in with same user creds but get a new/different session with a simlar but slightly different desktop than I get when logging in at the console directly. Any ideas? 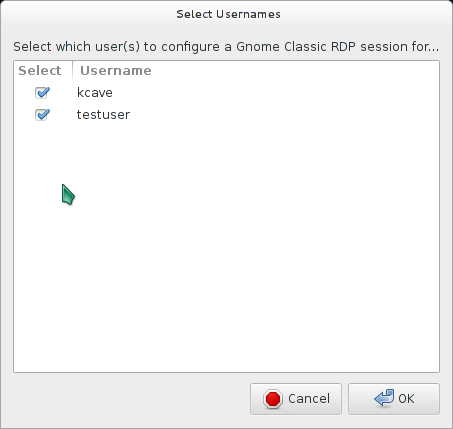 RDP on linux behaves differently to RDP on Windows. When logging in over RDP, you get a completely seperate X11 session – you don’t get the console session, which explains why you’re seeing that behaviour. It’s that way by design. If you want to be able to to continue work on a console session remotely, start a RDP session at the console and do work within that window. When going away, just close the RDP window – don’t log out of the session. Then remotely connect using the same colour depth (e.g. 16 or 24) and resolution, and user name that you started the RDP session with at the console – you will be reconnected to that running session and can continue working on whatever you left running there. It’s that way by some designs, but not always the case. For instance, my Ubuntu 10.10 Gnome installation was configured for use of the same session, but I’m having a devil of a time getting this functionality back in Kubuntu and Linux Mint 14 KDE (in which your script seems to work, by the way). Vino has an option in its VNC settings to enable the control of the active local login, as per http://ubuntuforums.org/showthread.php?t=266981 . . . this sort of behavior is what a lot of Windows evacuees are expecting. Is there a workaround you might be aware of or is it back to the drawing board with me? Actually, I appear to have achieved the breakthrough minutes later. With Vino as VNC part under Kubuntu and with the aforementioned settings checked and stock Ubuntu xrdp package, I found reference to “AllowSharing” as a setting under the Sessions area of sesman.ini . . . I added “AllowSharing=1” and achieved the desired result. I tried the AllowSharing setting added to sesman.ini after the x11rdp script on the Linux Mint machine and there was no change, however, so barring the discovery of a shared session setting in the x11rdp settings I’ll have to revert. Just got a new VPS host and went through multiple reinstalls before settling. This script saved me SOOOOOO much time. Donation has been sent and I will be shouting the existence of this tool from the mountains to anyone who will listen. I’ll probably release it as a BETA and try to get plenty of folks to beta-test it and offer fixes/suggestions before it’s unleashed as a fixed release. Hi, I’m running Ubuntu 12.04. Installed xrdp from Ubuntu packages and used it with Xvnc, worked like a charm. Built X11rdp, but not xrdp, according to your script and installed. Connects, I can choose the X11rdp session and log in, but then only garbage appears (random green and blue patterns, I can see something happen when I press menu button, but nothing else). although the password is definitely correct. I wonder about the XRDP in capital letters in that message. The file in pam.d is xrdp-sesman, is that the problem? Any ideas about one of the problems? Firstly Awesome Script, I just used it to install xrdp/X11rdp on a Roboard RB110 (specialized SoC robotics board i486 (yes 486) instruction set) running Debian 7 (rc1), took a bit of fiddling but I can login from mountain lion using the MS RDP client. However I have two small issues that hopefully you can help me with. Firstly if I log in as root it behaves the same as logging in locally, but logging in as a normal user fails on the first attempt after a reboot (exits right after the connect message) but after that it stays connected in subsequent attempts. Secondly a normal user login does not start the xfce-panel, I have to start it manually other than that it behaves normally. Cant see anything obvious in the logs or wrong with permissions. I recreated the user account from scratch and reran the RDPsession config tool; no difference in behavior. Any Thoughts?